Lucky to catch an animal doing anything today. They're all sacked out from the heat. Hey Strike; you have outdone yourself here. Super nice capture. Congratulations on your top 20 finish. Way to go, great shot!! one of the best. excellent shot. Very nice!!! Amazing capture....this is a 10 for sure! A tad sharp but majestic animals like this always merit the extra point, and you definitely stopped some motion. Nice effect with the water swirling. Lighting is a little harsh. 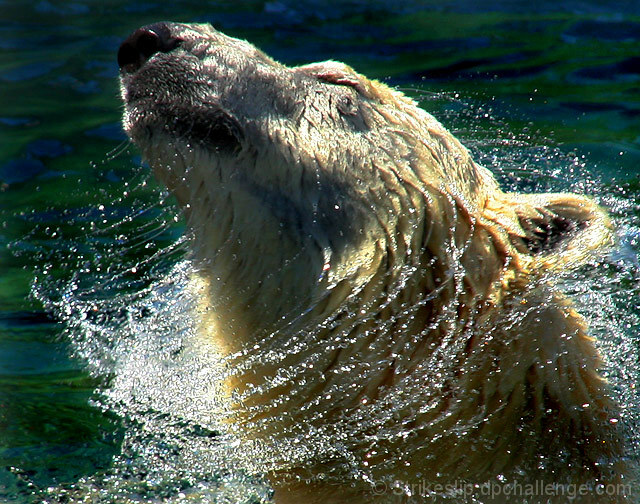 I love the circular lines formed around the bears neck with the water spray. Big points on the cool factor there. I'm thinking either your distance to the subject was too close and the focal point off just a smidgen, or your aperture was too shallow, as the forefront water is nice and crisp but the bear and some back spray shows some blur (either DOF or motion). JMO of course. Good luck in the challenge. This is probably just my eye, but the water seems a little oversaturated and fake feeling. Other than that, though, very nice image. Returning for comment and a bump up. Great capture, timing, subject, comp. I think that covers everything. ;) Looks like a ribbon for you. Good luck. Good timing on the shot. Love the pattern the water has formed here! Very nice stopped motion. Like the way you've filled the frame. Really like this photo! Great subject, light, moment, action . . .
awesome shot! if you go post your scores in the stop-motion thread, i'm sure everyone else will decide to go on call the challenge done and give you the blue. Amazing and difficult shot, not only because of the stopped motion but because of the subject - you really must have patience to get something like this. And of course the water forming rings around the head ... just beautiful to look at! Proudly hosted by Sargasso Networks. Current Server Time: 04/19/2019 02:18:21 AM EDT.